So this month (after Accessorising April was a huge success), that I was going to only boost my wardrobe with purchases and bargains from ebay. I was doing seriously well picking up three great dresses - one half price from the Boohoo outlet, a monochrome scarf printed dress from New Look for 99p and a draped black Berska dress, with studded shoulders for just £1.20 (they will feature in a post soon I promise). My big mistake was to think that I could indulge in a bit of 'harmless' screen shopping - I would like to say that I felt guilty buying the dress and tights from Missguided, oh and the shoes from ASOS (least they were in the sale), but I don't...not even a little bit, I wore them all together and I felt great in them and I get to share the look with you in my next outfit post...so that makes it OK right? So to make up for my digressions from the plan, I am going to construct my realistic wish list for May, entirely from bargains to be found on ebay...it was actually easier than I thought! 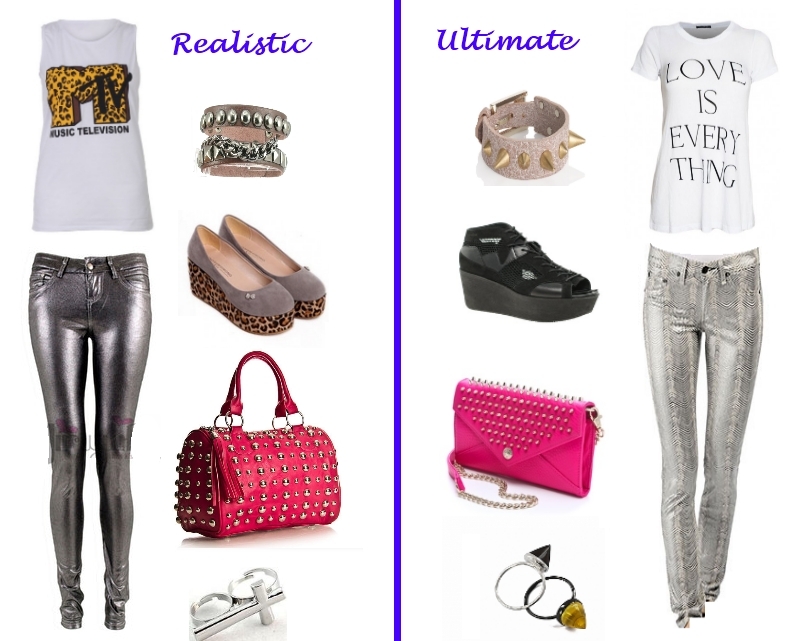 MTV Leopard Print Vest - £4.99; Silver Metallic Jeans - £24.99; Studded Cuff - £2.65; Faux Suede Leopard Platforms - £18.55; Pink Silver Studded Bag - £19.99; Double Cross Ring - £1.99. Wildfox Love is Everything Tee - £65.00; Rag & Bone Metallic Zebra Legging - £158.00; Felder Felder Taupe Gold Spike Bracelet - £95.00; Vagabond Conga Flatform Sandals - £65.00; Rebecca Minkoff Wallet Bag with Studs - £145.81; RP/Encore Carrot Spike Rings - £75.00 for silver/quartz. I'm really loving all my ebay picks, the pink studded bag and MTV tee may just have to be purchased immediately (I have an addiction, I need help). Still if I had the money, I would replace my entire wardrobe with Wildfox pieces - the LA brand only made it onto my radar this week after discovering it on the gorgeous Tessa-Jay's blog Circa Now. Check her out, she is a dream! So what is on your wishlist this month? Any fab ebay bargains to share? AMAZING post, I want the ebay jeans! I know how awesome are they? Yeah me too, they come in lots of different colours too. Aren't they great? Just a little bit more feminine than Creepers, but the same general idea. I love them too, I might have to get a pair, they are quite the bargain! Thanks Joelyne, that's so sweet of you to say!